75 BCE. Volcanic ash used in concrete. Roman, Greek, and Etruscan elements. 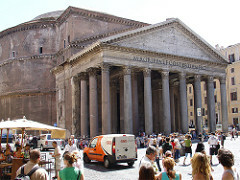 1 Cella with engaged columns – Ionic Order – Facade orientation, you are suppose to look at it from the front. 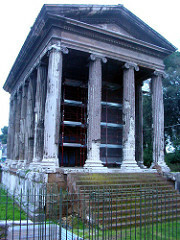 Italy – Early First Century BCE, Frieze around the top, on entrace, and a round cella. Pompeii, Italy. 70 BCE. Outer wall is 2/3 stories tall. 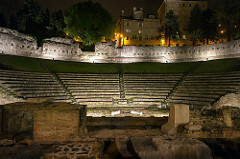 Cavea = Seating Area. Sits 20,000. Rome. 13 – 9 BCE. Marble with no ceiling. 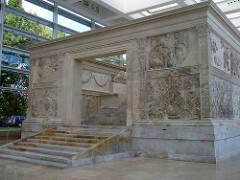 Actual altar inside honoring Augustae as military leader. Shallow relief – decorative/historical. 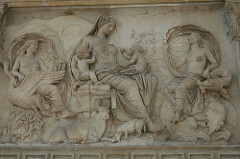 Frieze from east facade, depicts mother earth. Same date. Marble. 5’3” high. 1-10 CE. Used as outpost in Nines, France. Originally painted bright. 16 BCE – Foot Bridge on lower level, Aquaduct above. 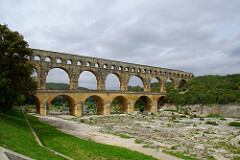 Part of a 30 mile Aquaduct. Asoanmasonry – Stone cute structure without mortar. “attic” two different aquaducts going in different directions. Rustication – “Rough” image to the stone, “dressed” is smooth. 81CE, built after military campaign through Jerusalem. Depicts the spoils of the Jews on Frieze. 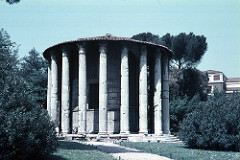 Built by Dumision (other son of Vesp) to honor Titus. Architect: Apollodorus of Damascus – Dedicated in 112CE. 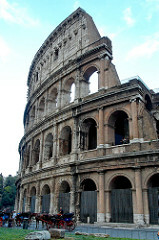 Part of the Quirinal Hill was removed, was a massive building for government. Dedicated in 112CE. 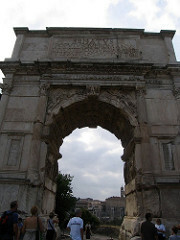 Located within the forum of Trajan. 128ft high, same height the hill used to be they had to cut out. 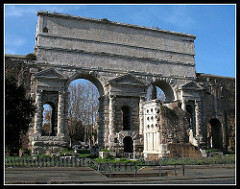 Trajan and his wife are buried there. 625ft of Frieze showing the prolonged campaign and defeat of the Deaians. NOTE: Trajan extended the Roman empire to it’s farthest boundary. 312-315CE. 69ft high and 85ft wide. Marble. 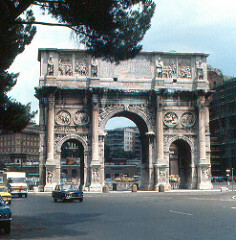 Built by Constantine himself. 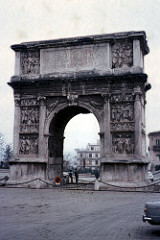 It’s a triumphal arch/three portals. Took other pieces of other monuments and put it on. The famous symbol – Kairoto. Trier, Germany. Early 4th Century Church. Wooden Ceiling. 220ft long – 106ft high. Apse: Circle/rounded ending. Late 2nd Century BCE. Looks like marble/such, used to imitate. Geometric in design. Looks like colored stone, very rich. Bright, illustration landscape – depicts broken pediment. 30-20 BCE/ 6’7” high. Very realistic (birds and such). First of atmospheric view. 10 BCE / 7’8” high. Linear and Delicate. Monochromatic flat space/black – most feminine style. 64-68CE/ Cpmbonation of 2 and 3 style. (Illusions and delicate- Illogical stuff starts to appears, details. 62-79 CE. Aprox 1’2” X 1′ 1 1/2”. One of the first appearances of still life.